Ink is necessary for writing on materials like paper and Bhūrja patra. The same is required to view the incised letters on a palm leaf. The lexicons give the names viz Mela, Maṣījala, Patrāñjana. Of these Patrāñjana is a paste used to blacken the letters on a palm leaf. 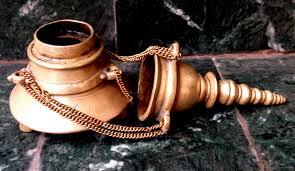 The ink pots are referred as Maṣīpātra, Maṣī Bhāṇḍa, Maṣikūpikā and Melandhu. Some scholars tried to derive the word Mela from greek but, later it is proved that the term is indigenous. 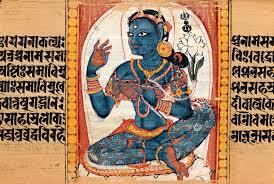 The earliest reference for ink is found in the Gṛhyasūtras. The use of ink is found from 5th BCE from Sāñci. 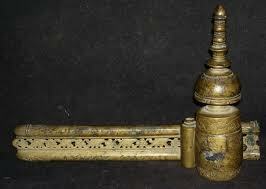 Jain cannons too refer ink. The earliest complete manuscript written using ink is the Kharoṣṭhi Dhammapada discovered in Khotan. The inks are of two types i. Delible and ii. Indelible. Delible ink was ordinary day to day purposes. Indelible ink was used for writing manuscripts. Various recipes for preparing ink are given in some works. The main theme is mixing powdered charcoal with gum and some other sticky substance like sugar-water mixture. The charcoal of pepul tree is baked in water with gum and collyrium from a sesamum oil lamp is mixed with this. This is for indelible ink. Ordinary ink is only a mixture of collyrium or soot, gum and water. Charcoal of almond shells is baked on cow’s urine. Such ink was used to write on birch-bark. Coloured inks are prepared in the same way or natural colours available are used. Śilājit, herbal juice are used for making clours. There are so many manuscripts with miniature painting in colour are available today. Gīta govinda, Caura pañcāśikā, śrītattvanidhi are found with paintings. Śrītattvanidhi manuscript is preserved in the Mysore oriental research Institute. Even gold and silver inks are also found. Mostly Jain manuscripts have this type of decoration. Manuscriptology Bhurjapatra, colour, ink, ink pot, Manuscript, masi, paper. permalink.